This week at Fresh Choice Nelson, we’re welcoming back Paula Saengthian-Ngam as our guest blogger (Find Paula on Facebook). If you love Thai food, this recipe is for you… This week Paula’s taking inspiration from a dish she fell in love with whilst travelling in northern Thailand. With a change in season, we change what we eat and what we feel like eating. Colder weather calls for comforting food, soups and curries are top of my list in winter. Keep a lookout for some new Inspire Meal Bags designed for winter, coming out soon. They are great if you’re short on time in the evenings, as most meals can be prepared and cooked in under an hour. All ingredients, except some of the pantry staples, come conveniently in one bag, ready to be picked up in store. Check them out online or in the fresh vegetable department of Fresh Choice Nelson. I love Thai food, and I have adapted this recipe from a dish that I fell in love with whilst travelling in northern Thailand. 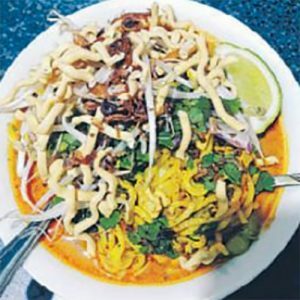 It is a curry noodle soup which has lots of great texture and with the addition of fresh chilli, you can add some heat. It certainly satisfies what I crave at this time of year. I hope you will give it a go. It will be part of the new winter range of Inspire Meal Bags, so keep an eye out for that option too! Fry the curry paste in the oil until fragrant. Add the chicken and cook for 5 mins. Add the coconut cream and chicken stock. Add the noodles and cook until they come apart. Add bok choy. Season to taste with fish sauce. Ladle into bowls and top each with sprouts, crispy noodles, coriander, a lime wedge and optional chilli.